I just finished watching the Top 6 performance night of American Idol. Not only that most of the finalists performed well in the competition, but also the votes to be tallied will be given an equivalent ten cents each. The money that would be raised will help people in Africa and in America. It surprised me to know that in America people are also starving. Amazing! If only the finances for the Iraq war are used to feed these people, it would make a difference. And how about including the Philippines in the recipient of Idol Gives Back? That would be nice. 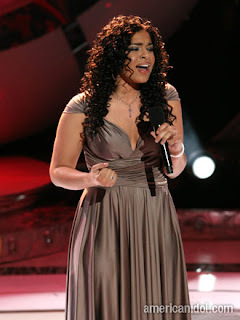 Anyway, I like Jordin Sparks' performance the most. Her song choice is great and is full of soul. I’m close to tears when the song ended. My hatest performance is from Lakisha. Last week she chose Carrie Underwood’s “Jesus Take The Wheel.” She killed Carrie’s song, and now she chose Fantasia’s finale song “I Believe.” I just don’t get it why she keeps on singing big songs when she can’t handle it. The judges’ keep on commenting that she’s screaming, maybe she can’t reach those high notes. I think she’s the next to go.